The Vicar has been a little pre-occupied last month…with his honeymoon! The Curate has sneaked into his slot to tell you about the Service of Thanksgiving for the Gracious Love of God with Farewell to Bishop Martin, on Sunday 21st September 2014. The service opened with one of Bishop Martin’s (and our Vicar’s) favourite hymns, ‘There’s a wideness in God’s mercy’, sung by a packed Cathedral. We also sang one of my favourites, ‘O Thou who camest from above’. The choir anthems sounded truly heavenly and I am pretty sure I heard a bit of Rutter that I last heard only two weeks ago in the Cathedral at the Vicar’s wedding. 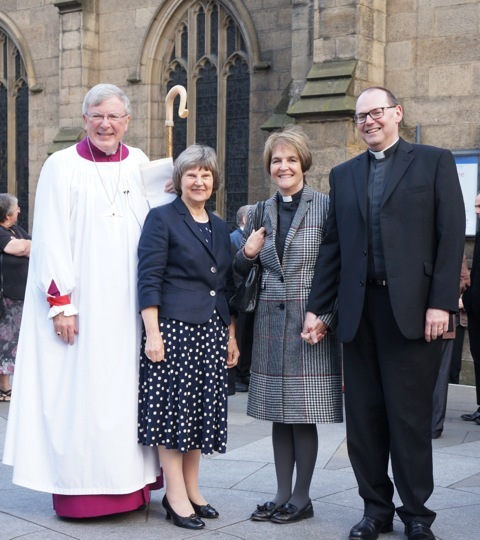 It was a joy to see Mr and Mrs Scott in attendance at their first diocesan event as a married couple! These things alone would have made it special for me but, as Bishop Martin has been my only Bishop, he sponsored my training and I was in the last cohort to be priested by him, it was a very moving occasion for me personally. The esteem in which both Bishop Martin and Marlene are held became clear when gifts and speeches were given from various parts of the Diocese. They included a book of memories, a Newcastle United signed and framed shirt, a miner’s lamp from Ellington, which the Bishop had requested himself and a letter from Bishop Methle of Botswana. Following his ‘Thank You’, in which he paid tribute to the clergy of this Diocese, our Lord Bishop of 17 years (the 11th and longest serving Bishop of Newcastle) received a standing ovation, just as he had at the clergy conference earlier in the year. I saw the tears of many which were also a tribute to this Christ-like man who lived out, (and probably invented) the Diocese’s strap-line of being ‘generous, engaged and open’. As he gave a final blessing from the High Altar, I thought how well the words reflected himself. I know that Paul, our Vicar, holds Bishop Martin in the highest esteem and it will be a difficult task for him and the rest of the Vacancy in See Committee to find his successor. It will probably be 2016 before that is announced and so we are especially grateful for Assistant Bishop Frank. We pray for him and our Archdeacons as they oversee and guide our diocese in the meantime. As for me, I am glad that my family and I are now full-time residents of this lovely town and I look forward to bumping into you on the streets… Though hopefully not literally as I am still learning to ride my bike around town!